"So many fancy themselves as something greater, as something more noble. They see the Sith as manipulators, as backstabbers, as cruel and unyielding. The Jedi do not see their actions to manipulate the galaxy into their desired image as what it really is. The Mercenaries will try to justify their credit-mongering as just the way they do business. The Loyalists will try to insist they are only doing their duty. The so-called Gray Jedi insist they can walk a line between the Dark and the Light sides of the Force. If nothing else at least I am honest to who and what I am. I don't have to lie to myself to sleep at night." Bentre Stahoes is a Corellian born Sith. Born as Bentyl Stahoes, he is known in Twi'leki society as Kairn'tel Versea. Identifying as an Obelisk before the destruction of the Order by the command of then-Grand Master Darth Pravus, Bentre has never ceased to consider himself one of their number. Since the passing of the Obelisk Order, Bentre has tried to embrace the Sith Order more openly and willingly. 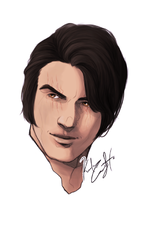 He is a man full of pride- as a member of Clan Naga Sadow and to an even greater as a member of the Versea Family. His attitude, speech, and even his very walk show off an obvious sense of self-importance. This Sith's ego has been considered by some to be in sufferable. Many times, he expects more than is fair from allies and subordinates, choosing to push others aside rather than to explain what he desires. This can result in a "shoot now, ask questions later" mentality that puts him at odds with others. Despite his haughty attitude, there are some individuals whom manage to earn his respect- such as those who views as fellow warriors, those who have proven themselves to be loyal, or those who possess great strength. Still this has not prevented the man from turning his nose up to any given person who manages to earn his distaste or loathing. Even since becoming a member of the Dark Brotherhood, Bentre continues to push himself in the area of computer programming and slicing. He typically keeps a datapad on hand "just in case" and he takes a child-like glee in the act of breaking into computer systems. He considers himself to be a pretty fair Slicer and will lunge at opportunities to prove his mettle against more high security systems. Though he was once more conservative with his combat prowess, he has been less reserved in showing his physical might as he has climbed the ranks within the Brotherhood. Still focusing on honing his non-combat skills, Bentre demonstrates a desire to be different and more than just another sword hand. He also possesses a softer side, demonstrated by his love of the quetarra in public on occasion. Bentre grew up on Corellia, raised by his mother and father. Though he felt they loved him greatly, the boy gave his parents no end of grief. There were few evenings that he did not come home with a black eye, a bloodied lip, blood on his shirt, or being hauled home by law enforcement. Stahoes was far from a common thug, though. Though he got wrapped up in childish conflicts with other youth his age, the boy actually tried to make something of himself as he went through his school years. As he progressed in his education, he increasingly found himself thoroughly bored. When he wasn't getting into scraps, he was playfully trying to penetrate the network security of a local sector; just to see if he could. Over time, he developed what would be described by his educators as an unhealthy obsession with computer systems and manipulating them. One guidance counselor wrote of Bentre that he displayed a cold disregard for his peers, which borders on anti-social, and may indicate some problems at home. Not that his parents did anything but try to give their son the best home life they could. His father was a low-level banker who worked hard to be sure his family want for nothing. His mother was a homemaker, previously a network architect, who gave up her passion to raise a family. This did not stop Bentre from breaking his parent's hearts at the age of 15. Using the terminal in his father's study, he sliced into his father's financial account and withdrew everything. Using the credits he wired to an off-planet account, he secured a ride off his homeworld. Finally, in an uncharacteristic act of concern, he scribbled a note to his mother he was going to have to disappear for a while. Unknown to Bentre, he had a brother who lived on another part of the planet, who moved back in with his parents. This child unknowingly assumed the identity of his missing sibling. The Stahoes family, save for the missing Bentre, moved to Selonia in an effort to hide the deception. Just like that, it seemed as though the galaxy spun on without a care. Following his departure from Coronet, Bentre traveled by shuttle from system to system for a few months, living comfortably on the credits he had stolen from his parents. Too soon, his ease with spending credits managed to attract the wrong sort of attention from people. He found himself coping with hangers-on and busybodies eager and determined to get a little taste of his wealth. Just when Stahoes could not stand the unrelenting attention, relief appeared. A Duros named Garan kindly befriended him, watching his back and keeping the seedier elements away with a quiet menace. The Human gave little thought to the ease with which his new companion was able to wave aside such nuisances. This lack of care proved to be his downfall. Bentre did not realize that the ruthlessness nature of his newfound bodyguard drove away the others. Nor did he realize that the Duros did not have his best interests at heart. The Corellian was the target of a two man con. While Garan kept Bentre busy and feeling safe from the less pleasant elements of Nar Shadda, his partner, a man by the name of Jallo Makk had been slowly working on slicing into Bentre’s accounts aided by information that Garan provided him. Once Jallo had finished funneling the money from the account, he went to a local bar for drinks using his newly-acquired wealth. This caused Garan to become angry, resulting in angry words, a drawn weapon, and a dead bystander. Having already used the boy, the pair conspired to frame Bentre, calling into the local law enforcement, filing reports, and bribing several officials. Betrayed by the one person he felt he might trust on the Smuggler's Moon, Bentre found himself destitute, with several warrants out for his arrest on the suspicions of robbery and murder. As Stahoes was on the run from the corrupt law enforcement he met La'venna and her little band of scoundrels. The gang was quick to permit him into their ranks and treated him as though he were family. The human was dubious at first, but La'venna proved her sincerity when she saved his life during a heated conflict in the streets. Among one of his many souvenirs of his time with the small gang, the Jade Kodashi, is the blaster that Bentre would carry for many months before it was destroyed in a duel. His time of relative peace proved too short-lived as thirteen months later, Garan and a small band of mercenaries managed to hunt down the Corellian. The Duros told him it had been the work of the Twi'lek and her rogues that had brought him to their attention again. Garan smiled, giving a mock apology, claiming he always hated when "contracts end like this." As Garan was about to pull the trigger, a fellow gang member by the name of Sian shot the Duros in the back, saving Bentre's life. The Sullstan rogue went on to explain that he had been trailing the human for the last few hours by order of La'venna. Unfortunately, though, Garan's words had planted a seed of doubt in Bentre's mind. When he returned to their hideout, he promptly pulled a blaster, shooting the Twi'lek woman in the stomach, and fleeing angrily in the wake of the resulting confusion. Once again, he found himself on the run, with fewer and fewer options available. It was during the aftermath of these events that Marcus Kiriyu found the Corellian on Nar Shadda, and helped him escape the planet for good. Once the Corellian found himself at the Shadow Academy, he hit the ground running, throwing himself into studies of history, practicing with the training lightsaber he was granted, and further sharpening the skills he had already picked up as he served as a member of the Jade Kodashi on Nar Shadda. He tried desperately to forget his former life, but he still experienced nightmares about the things he experienced there. His eagerness did not go unseen, as soon after he left the Shadow Academy and joined the Clan Naga Sadow, he was paired up with Daedric Turelles. The tenacious attitude of the student was well met by his new Master's own inclination to seek knowledge and to self-improve. The Dark Jedi Knight tried to press his apprentice to excel, and was pleasantly surprised to see Stahoes step up to his challenges. Like a man possessed, Bentre continued to process information at a surprising rate. Though his Master never seemed to realize it, the drive to better himself was borne of a fear of betrayal. Bentre wanted to be sure that when he got attacked again he would be able to drive off his rivals. He continued to make a name for himself, eventually joining Sapphire Squadron. Over time, he finally dared to hope he could finally find the sense of family he had lost on Nar Shadda. His first truly notable conflict as a member of Sapphire Squadron was the attack on the pirate moon of Atlas. Dropping in with the rest of his Battleteam, Bentre served with distinction, helping to clear and secure the hanger area. He kept himself busy clearing out soldiers with his blaster, before moving forward with Daedric, Macron and Shi Long and cutting a swathe through the battlefield. The armored forces of Scholae Palatinae followed up behind the four, ensuring victory for the joint operation by the clans. Later in the year, Bentre was inducted into the Order of the Black Guard] and attained the rank of Dark Jedi Knight. He was given charge over Wrooshuu and tried to work closely with the Wookie in order to expand on his own knowledge and experience. He also used his position as a Blackguard to become a more finely-tuned killer. He continued to distinguish himself in repeated combat against both fellow Dark Jedi and Jedi alike. He found this increasingly difficult as madness began to overtake him. The Dark Jedi Knight began to work toward a basic mastery of Shii-Cho and began to study war as a whole. The Corellian was determined to do everything in his power to build his strength and power. Stahoes also worked closely with the Battleteam Leader of Sapphire Squadron, Bob Sadow to further the glory of his Battleteam. He tried to work on converting the Team's resources to create a training area, but found they lacked the required area to keep such a dedicated space. Instead the slicer worked on preparing a computer program to be used in conjunction with several holographic projectors to create an easily modified training room which could literally be set up in any open area. To his knowledge, the paperwork for his request was lost in the preference or more pressing matters, but having put forward the plans Bentre chose to focus on his own training and look for other more accepted ways to further his comrades. He also began to have to contend with the real threat of his slipping grip on his own sanity as the effects of his replacement eye were becoming more and more evident as time went on. He found that he had to remain at times very isolated from the very people he had grown so close to in his new found family.
" The Darkness will grow; but as a cancer out of control; stars shall be extinguished; whole systems laid to waste"
As his time continued on in the Dark Brotherhood, Bentre found his cavalier attitude and scoundrel-like ways made him feel ill at ease with the Brotherhood as a whole. The Corellian felt that his chosen skill set made him- while not a pariah- set apart from his comrades, and not in a way that he had to tried to affect. This feeling was further reinforced by the words of his then-Rollmaster Anima following a conflict on Nar Shadda. There the pair experienced an encounter with Garan, an echo of the Corellian's past on the moon. The Obelisk had allowed his past to define his attitude and tactics and had prevented him from growing to his full potential. 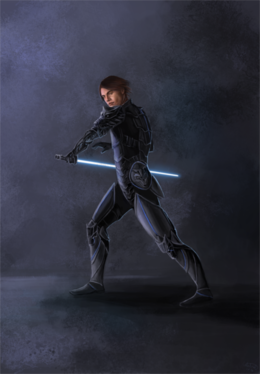 Garan's death became an epiphany for the young Journeyman, and marked a slow change of focus from blaster-based combat to a more conventional lightsaber-based combat style. The Dark Jedi Knight would still carry a blaster, but he was no longer dependent upon it as he had been. Bentre continued to gently develop over time. Taking up the position as the leader of Devil's Shroud, the Shadow tried to focus on building up the members of his team, attempting to better both his team and himself in equal measure. His efforts seemed to be pay off, and though slowly, Devil's Shroud began to thrive despite his innate lack of experience at the time. To his chagrin, Stahoes still lost two men under his command within the first few months. With each stumble and each obstacle overcome, he urged his fellow Battleteam members too look toward the future as an opportunity to grow and improve. This new viewpoint did not serve him very well in the days to come unfortunately. The zenith of this transition would culminate following the resurfacing of Darth Vexatus. The Heretic brought news of a new threat to the clan, and unrest spread through the Clan. The close-knit Sadowans split in two, between those who believed the Falleen's warning of approaching doom and those who backed the Consul Locke. The Consul felt determined to hold the Clan together at all costs, meanwhile discounting the Prophet-Heretic. Adding to the chaos, the Rollmaster and the Corellian's close friend, Marcus Kiriyu chose that time as the perfect moment to make a power play, seemingly determined to overthrow both Locke and Xanos. As the members of his Battleteam chose sides between the Consul and Vexatus, Bentre chose to side with Kiriyu, secretly hoping to take advantage of whomever would prove the victor in the struggle. With the Clan members making their decisions, the hunt for the Shards of Dentavii began. The Shadow could not have known what would come of the hunt. As he and Tasha'vel Versea hunted the asteroid surface for any signs of the artifacts, fate would have it that Bentre would literally trip upon one. Though the Twi'lek realized the peril the shard represented, the Human could only see the potential that it unlocked. Attacking his comrade in arms, Stahoes was shortly thereafter ambushed by Locke-loyalist forces and the shard was taken from the pair. Great damage had been done to both mind and body but even as the Corellian lay unconscious he could feel the power of the shard calling to him, a silent but deadly siren's song. Under its influence, he would once again use the artifact, both to attack and escape from the clutches of Sanguinius, Armad and Darkblade. Realizing there was no time to waste, he did rendezvous with Kiriyu to deliver the Shard. With it in hand, the pair headed to Dentavii Prime, attempting to fulfill the Krath's vision. It would not be until after the events on Dentavii Prime that the effects of the shard on the already remarkably fragile psyche of the Sith would be fully realized. He would begin to hear voices more regularly and suffer irregular periods of rage, aggression, and schizophrenia. Compounded with the friction between himself and others, this served to shatter the man's feelings of relative safety and family among the others such as Atra. The feeling was replaced with a cool distrust, which he struggled to keep hidden beneath a facade of arrogant confidence. He also struggled to adjust to the presence of his new prosthetic arm, a bionic device that he had designed. Frustrated and lacking the knowledge necessary, Stahoes was forced to seek help in acquiring the proper software to make the device operate. Though the contractor got the work done, Bentre began to read up on the software and code involved in the operation of such technologies. He was determined to ensure he could do the work himself in future. The weeks following the events on Dentavii were largely uneventful. Beyond some rather macabre- and to some disturbing- experiments by the Corellian, surprisingly little seemed to change at first. Slowly, those close to Stahoes realized he had begun spending more time in his office and quarters, choosing to act through holos and proxies. The Sith normally preferred to work and fight alongside his team, so this began rumors and murmuring among many in the city-base. An unrest began to echo out among the local populace around this time. A small but vocal militia arose from the common folk. Before long, they were rallying citizens to their cause. They claimed the city and land as their own as birthright, demanding the Sadowans vacate the land immediately or face dire consequence. Their claims and cries were ignored, to the point that a small army had begun to move on the city. Realizing the people could pose a larger threat if they were not dealt with, Stahoes contacted his old comrade, Scarlet. With their combined efforts, Sapphire Squadron and Devil's Shroud were successful in repelling the forces of the revolutionary calling herself "Chelidon". Many depicted her as a Zeltron warrior, carrying tattered banners to display their allegiance against the perceived trespassers. The rebellion was short-lived thanks to the quick and fierce actions of Lexiconus and Macron Goura. The base of operations for Chelidon's people was reduced to ash. Unbeknownst to the rest of the team however, Bentre had recieved one last transmission just two days after their supposed victory. "Chelidon's Army Will Rise Again. Beware those who serve the Yellow Sun." " It's amusing, is it not? How often the snow is mistaken for ash? I think I'll call this piece: Ashes fall. " The event that came to be known as Ashes Fall started with a crashed ship. An unmarked transport descended in a fireball, carving further scars into the Shadowlands of Sepros. Aware of the foreign object descending on the planet, soldiers were dispatched to investigate. The troops were met with an enigmatic resistance which wiped out every sentient there. Their cries went unheard by the Warhost, the bodies being stripped of metals and left to rot. Twenty-two minutes later, receiving no response from the men in the field, the Warhost contacted the Cult of Sadow to inform them of these strange developments. Members of Naga Sadow were sent to investigate. One team led by Sanguinius to investigate the catacombs below, and another led by Atra to investigate the Shadowlands above. It was with the latter team that Bentre was dispatched. As the teams investigated, they were met with robotic opponents- quick, efficient, and as deadly as they were alien to the Clan. Some were merely machines, whereas others employed both organic and mechanical components. The fiercest of these could rival even Elders, while all could prove deadly to Journeyman caught unaware. From those designated Archanea up to the Titan variants, the machines proceeded up from a factory below the surface, discovered by the Ragnosian Quaestor, Sanguinius Tscyra. As the Progenitor's legion threatened to overwhelm the Clan, Shi Long, Ventus and Stahoes followed Xia Long as the Force guided the Long family's Matriarch straight into the bowels of the Progenitor's ship. As they traveled, the Knight worked with his datapad. At first he had hoped to confuse, reprogram, or shutdown the droids. As they went deeper in, he realized that the destruction of the ship and their Master was the only sure way to do so. A large number of Echidna awaited the four, forcing all but Xue Long to retreat- who alone charged deeper in. Unknown to Stahoes at the time, the Umbaran Quaestor had taken his impromptu solution with him, carrying the device into the chamber of the Progenitor himself. That was the last that the Knight saw of Atra Ventus before the Progenitor's ship exploded behind him. The death of his friend rocked Bentre Stahoes more deeply than he could have ever fathomed. It was like all at once, his whole world had been crushed. Within the Brotherhood, he had formed this imaginary bubble around all his friends and comrades. Nothing could touch them, the Force was with them. He had allowed a child-like hope to rise up within him. When the bubble burst, the Corellian could only feel despair. For weeks it seemed that nothing could console him. Once again he was as a teenager, picking fights for the sake of fights. A deep self-loathing set in his stomach, even after being recognized for his skill and valor, the newly-promoted Warrior struggled to overcome the grief at is lost friend and mentor. His whole world had come crashing down after that day. Bentre Stahoes did find some solace in the midst of his grief. His prior rival, Tasha'vel, reached out to the hurting Sith. The grudging, borderline respect the Human felt for the woman grew into something more earnest. At times all the two did was spar, as Versea used the martial art of Echani to help Stahoes gives his pent-up energy an outlet. Other times, she helped him to talk through his feelings over a hot cup of stimcaf. She was a support to him after his fight with her Quaestor, and later as he struggled with the unearned contempt he felt after fighting Keira Viru. It would be this support which kept him from slipping into inconsolable grief in the events to come. He would still remember the day when the Grand Master put out his orders concerning the Orders and the aliens. Krath and Obelisk were to be no more. All but certain species were labeled, along with the former Orders of the Dark Brotherhood, as Undesirables. The Temple Tiamat, the Temple Boyna, and the Shadow Academy were ordered purged. "Sub-human species, disease carriers, Jedi, and potential terrorist aliens..."- the words would echo in his nightmares for weeks afterward. When at first he had been told he would serve to protect the Iron Throne and strike out against those who threatened the Dark Jedi Brotherhood as a member of the Inquisitorius, Bentre Stahoes had felt some measure of pride. He worked hard, ascending to the position of Chief Inquisitor. His stomach only soured as he was given his commands. Still, the Corellian found himself marching with his fellows against the Temple Boyna. Though he had been, and still was Obelisk, he took part in the slaughter like a man possessed. He would remember every scream, every cry, their pleads for mercy falling on deaf ears. In the back of his mind, he was trying to figure what these people, his people had done to become a threat to Pravus. It would not be until a day later that the insanity of the Grand Master would dawn upon the man. It was at that point he decided that while the true dangers to the Brotherhood needed exterminated, he owed the Iron Throne no such loyalty. With this realization in mind, Bentre strove to be a better Sith. As Keira vacated the position of Quaestor, Stahoes fought for the position, being set aside by the Summit- to his anger- for the man he not-so-secretly considered a traitor to the Clan, Darkblade. His efforts for his fellows was not unseen. In recognition of his ability, his drive, and his dedication (Bentre presumed), the Corellian was appointed to be the Aedile to the Anzat. Feeling scorned, the Warrior took to the office with a fervor, determined to show his competence and skill. In his heart, he promised he would become Quaestor. If there was one thing he had realized as he had dealt with his fellow Sith, treachery was in their nature. It was only a matter of time before he usurped his superior. Time would tell what kind of scars he would leave on the new Quaestor when the time came. It was shortly after his appointment that Stahoes' feelings toward Tasha'vel Versea came to a crest. After some discussion, the two decided that a life together would be far better than a life alone. Tasha'vel presented the Corellian with an Echani blade of his own. The two agreed to be joined in the Jasshi'rr, Twi'lek One-ness. Faced with such affection, the Sith wanted to be able to return the comfort and love that he had received from the Twi'lek woman. He wanted to have a sweet and tender relationship. Vowing to act as a honorable member of the Versea, Bentre quietly assumed the role beside Tasha'Vel as Patriarch of the family Estate. In that moment, with the congratulations of his Clan in the background, the Corellian felt a momentary peace and unparalleled joy. In his new station as the Patriarch of the family, Bentre realized that the family faced some small risk of disappearing from the galaxy. His wife, his brother in law, and himself were the only surviving members of the Versea. Realizing this, he reached out to a few choice individuals to join as new branches within the family. Those who were chosen took a mark chosen by the Patriarch and approved by the Matriarch; a brand that acted as a symbol of their unity as a family or a 'pack'. The ideal had been pushed forward by Stahoes, being akin to the Blackguard tattoo which the Sadowan carried upon his right arm. He wanted the wolf symbol to act as a permanent mark of their commitment to the family. The brand would be administered by either the Matriarch of the Patriarch via a ritual in which the symbol was burnt into the flesh of the received. The pain experienced was a symbol of 're-birth' into the family. Upon completion, the individual would be given a new name and given access to the family estate on Ryloth. As an example to the others, Bentre was the first to be branded and to take his new name of Kairn'tel. The joy he felt peaked, but the gravity of the situation within the Brotherhood hit him hard as the Iron Legion struck. In what seemed like a moment, the Herald disappeared and New Tython had been razed. No longer could the Corellian stand idly by as he quickly realized the presence of Jedi in his Clan did not bode well for Naga Sadow. While the idea of allying with Jedi irritated him, the Sith Warrior chose to do so in order to build up a defense against the mad leader of the Brotherhood. It was in the moments that the news first reached him that Bentre realized that this was- for the moment- bigger than the long-standing conflict between sides light and dark. He needed to make the Sith Lord pay for what he had done to the Krath, the Obelisk and the rest of the Undesirables. Bentre decided that one way or another he would wage a personal war against the Grand Master. He would have his revenge. 34 ABY would find the Sith fighting the Dominion threat alongside his Clan. The Operation designated Firestorm by the Consul brought the Sadowans to a known base of operations in an attempt to push back the rival faction. Bentre marched along with his fellows to attack a Star Destroyer in orbit above the planet. After managing to secure the hanger, the Corellian took it upon himself to try and disable the ship's weapons. His attempts did not pan out as expected, as the Hammer of Cha'kota plummeted to the planet's surface, and Clan Naga Sadow was forced to fight their opponents on their home turf. The operation was deemed a success by the Clan summit, and the Dominion were believed wounded and defeated for the time. It was never said the conflict was over. They still did not know the location of Cha'kota, so the killing blow could not be delivered. As the members of House Shar Dakhan settled into a period of relative peace upon Aeothoran, Stahoes found he could not settle himself. Long arguments ensued between the Aedile and Quaestor about the relative threat of the Dominion, and the possibility of a future attack. Eventually, Darkblade relented, agreeing that preparation for such a possibility could not hurt. Together the pair initiated Operation: Homeland, taking the form of a simulated attack upon the planet by Dominion forces. The defending forces were played by Darkblade and a selection of Dakhani, while Bentre staged the faux attack alongside his former apprentice and another team. The simulation went well until a number of the Warhost accompanying them began to act erratically, attacking the Lion's Tooth without orders being given. A number of Clawdite infiltrators had staged a real attack. The attack was put down by the combined attempts of both Teams Offense and Defense, and House Shar Dakhan stood victorious at the end of the day. However, paranoia gripped the Battlemaster. As Darkblade began to congratulate the House on their victory in the attack, Stahoes ignited his lightsaber and plunged the weapon into the Quaestor's back. Chaos ensued for several moments as a number of people jumped upon the Corellian. The Anzat appeared dead on the ground and the Sith was restrained as they examined the supposed corpse. To the surprise of all, the body reverted into it's native form. At some point, Darkblade had been replaced by a Clawdite. The Aedile had unwittingly slain an enemy of the House, and inadvertently saved the day. More than one of the House moved to congratulate Bentre, but the stress of the events proved too much for the man. Confused and overwhelmed by this turn of events, Stahoes lost consciousness. In the days following, the Aedile spent a few days in what appeared to be a coma. Upon hearing of the events that preceded the condition, his wife boarded a transport to see for herself what had happened. When the events were described to the Twi'lek in person, she very calmly gathered up her husband's things and announced to the Quaestor of Shar Dakhan that like it or not, her husband was leaving. Tasha'vel then spirited the Corellian off world back to their estate on Ryloth, tasking the servants there with his care. She was unable to stay long however, as the duties of her position called her back to the Markosian City, and she was forced to leave Bentre in the care of her brother. The Quaestor then took her husband's weapons back with her, leaving him with only his clothes set on a table beside him. It was unknown when or how well that Kairn'tel would recover from the incident. House Shar Dakhan was left for a time without an Aedile. The next few months would be slow for Stahoes, as he would be secluded within the Versea Estates as his wife had promised in return for his safety. Privy to the man's slicing abilities and fearing he would try to improvise an escape, the Twi'lek relieved him of all personal effects, save for granting him use of a pad of flimsiplast and a chunk of graphite with which he could write. A slave collar was fitted on the man as a means of tracking him, but otherwise he was given free reign of certain portions of the couple's home. In this condition. the Corellian had only three things to look forward to: the setting of the sun on another day, the regular meals provided for him and the eventual freedom that seemed would only be afforded by the Versea Matriarch or the Snake Quaestor. News of the chaos within the Brotherhood and finally Bentre decided he had enough. Breaking his house arrest, the Patriarch fled the estate and made his way back toward the Orian System. Arriving upon Aeotheran unannounced, the Corellian dwelt quietly among the population for a time, watching the effects of the Sadowan's rule upon the people of the planet. After a few days of contemplation, Bentre brazenly marched his way directly into the Lion's Tooth. Judging himself capable of taking up his old mantle again, Stahoes challenged his Clan-brother and fellow Versea Zachary O'Maille to return his office to its rightful owner. A heated conflict ensued as O'Maille was reluctant to step aside, but in the end capitulated when facing the wrath of Kairn'tel in combat. A few hours after this event, Locke Sonjie called Bentre to the Courtyard of the Lion's Tooth with an announcement. Stahoes' return had not gone undetected by Sonjie, and in light of the departure of Darius Tu'kul, the Clan was without a Rollmaster. The Summit had chosen Bentre to be his replacement. The next few weeks would prove quite interesting for the fresh Rollmaster. The man tried to take to his task with gusto, pouring over the mounds of paperwork and datapads left to him, some of it dating back to the time of Anima's time as Rollmaster. Meetings with Sanguinius and discussions with the Quaestors would follow his appointment with an almost irritating regularity, but the Corellian still tried to keep his nose down to the grindstone. The Clan had believed him up to the task and Bentre pledged not to disappoint them. Another factor however complicated matters, cropping up barely a week after the Sith situated himself within the Temple of Blood on Sepros. For the first time since he had forcibly ended his imprisonment in his home on Ryloth, the man was contacted by his wife, Tasha'Vel Versea. The Twi'lek Matriarch delivered congratulations on his new position, along with some joyful news. Tasha'Vel had borne him a daughter, having kept her pregnancy a secret until the birth of their half-Twileki child. The Versea family now had a new member. ""While the other Clans scramble to survive, while Pravus destroys everything he sets his eyes on, let us safeguard and study these relics of the past. We will ensure their survival and we will use them to our advantage. Let it be declared that any artifact of the past - any tome or holocron - is ours by birthright."" The joy following the knowledge of his daughter's birth did not offer the Rollmaster any lasting reprieve. The threat of the Grandmaster still lingered at the edge of his thoughts even on the occasions when he could hold his infant in his arms. The demands of his office kept him busy as he addressed the needs of his members, but there was a more pressing matter. Naga Sadow's Consul had already announced their self-appointed mission to safeguard the treasures of the past from the hands of the Grand Master and his Inquisitors. More than that, Sonjie wanted to embrace the power that knowledge and artifacts could offer in hopes that with the Warhost military, Clan Naga Sadow would become unstoppable. To this end, Stahoes and others began to plumb existing libraries of data, study ancient legends and sometimes even pursue mere rumors in hopes of uncovering some yet-undiscovered trove. It was on this premise that the Lion of Tarthos reached out to the Corellian Sith. A map, though incomplete, hinted of a yet-untouched site on the ancient world of Moraband. Recognizing the potential to secure some artifacts for the Clan, Bentre assured the former Grand Master that he would have a team on the world in three days time. Under the designation 'Sands of Time', the excavation of the site went as smoothly as could be desired at first. However, part way into the operation, Sadowans on the ground found themselves plagued by confusing visions of grey creatures. Almost two hours after this, contact was lost with the expedition, and Riku Amahara was dispatched to investigate. When news of the reached the Summit that Riku had discovered gray, armor clad humanoids on the surface, Locke Sonjie ordered the deployment of all Sadowans to assist in reinforcing the ground teams. Bentre himself would assist in the fighting on the ground, and ultimately the recovery of a number of artifacts. The events under the planet's surface had a distinct affect on the man's wife, however. He noticed a change in her demeanor, but he could not quite pin it down. It was as though something haunted her from behind her own eyes. Tasha'Vel had been influenced by the most notable of the artifacts. While a duty to his wife pulled the man to attempt to comfort his spouse, ultimately the demands of his office rendered Bentre incapable of taking the time he felt necessary to offer his wife the extended support she might need. Instead, he chose to trust she would be able to gather her own inward strength to cope with the experience, and once again threw himself into the tedium of his work. Despite the time he had spent in teaching the basics and theory of Sith Alchemy, Stahoes found himself woefully inexperienced in the application of the craft. This, coupled with the fact that his work put him into closer physical proximity with Pravus' loyalists than he liked, brought the man into an uncomfortable position. After a great deal of deliberation and too many bottles of Corellian brandy, Bentre drafted a resignation letter to the Headmaster of the Shadow Academy. The resignation went more smoothly than he had expected, with little more than a form letter being sent back in return. Although this freed the man up to explore the mysteries of Alchemy for himself, there was still one thing that he lacked: a proper alchemical forge with which to work. The disappointment of this fact was short-lived, given that Clan Naga Sadow was home to the infamous " Mad Alchemist", Macron Sadow. When asked, the Elder who had once replaced a ruined eyeball in Bentre, was more than willing to compare notes. Compared to the immaculate and sterile environment of a classroom, the world the Battlelord consequently found himself in was that of blood and chemicals, of horrors and secrets. Despite his own misgivings, Stahoes found a greater friend and ally than he had imagined in his continued pursuit of power. To his relief, taking his leave of the Academy did not mean an end to his searches, but rather revealed a deeper well of knowledge than he had first expected. With a new bond forged, the two would engage in conversations outside of just Sith Alchemy, including ways to hinder or possibly halt the Grand Master's swathe of destruction in light of the attack by Atra Ventus on the Sadowan fleet.
" His actions aside, this data may be of some use." In the days immediately leading up to the Twelfth Great Jedi War, Clan Naga Sadow continued to reinforce and reorganized in preparation for the upcoming conflict. Reports had been recieved by Kojiro Keibatsu of an anomalous heat signature on Terra Do Gelo. 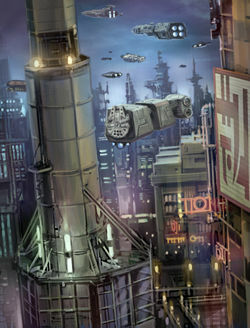 Sending teams to investigate, the threat of mutated creatures of unknown orgin and rogue droids had been located at three points. With Armad of Marka Ragnos and Jurdan Krennel of Shar Dakhan, Bentre answered the call for assistance by the Markosian Quaestor. Stahoes was tasked with securing the Mining Complexes on the continent- a task that he took to with great relish. Though droids were his primary threats in the mines, the operation led to the discovery of Dlarit-owned facilities that had also been augmenting arctic lifeforms to great effect. As the Sadowan assault teams surveyed the aftermath, The Sadowan Battlelord grew silent as he carefully considered everything he had experienced. He could see the potential of the experiments conducted at the sites, but was irritated by the limited effects such tests produced. As his fellows tried to make greater sense of the refuse and remains of the former Dlarit site, the Sith had already began to compile a list of mental notes. The resources afforded by the reaquisition of the continent were limited in their own rights. If combined with the arcane secrets afforded from the research of Sith Alchemy, then perhaps Naga Sadow could strike back at the likes of her enemies. His mind boggled at the possibilities. Bentre believed that given enough patience, the treacherous Palatinae could be repaid their trangressions in kind, the Iron Legion could be pushed back and even the Grand Master would fall to the glory of their Clan's collective power. The actions of the Quaestor and his entourage beneath the standard of the one-eyed wolf were seen as distasteful in the eyes of both Consul and Proconsul. The death of prisoners left the Clan's Consul upset, and Bentre attempted to soothe the Entar with words. Stahoes believed that, as he told his immediate superior, that the data extracted from the sites would prove useful. Though he said so in earnest, he did not tell Sanguinius of his intent to use the Markosian House leader as a tool and a stepping stone. Stahoes still had a lot of information to gather and research to do. The pursuit of greater knowledge and power had not and should not be ended. 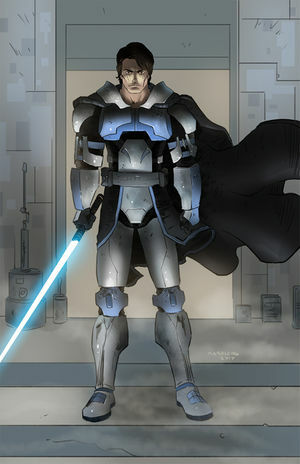 While the Clone-turned-Keibatsu was a brief liability, the greater threat of the Inquisitors were of greater import to the Versea Patriarch in his service to his Clan. Kojiro was but one of many strings to be pulled. "I’m going to link up with our other two agents and get them back to the extract shuttle. You lot are on your own from here. Good luck." 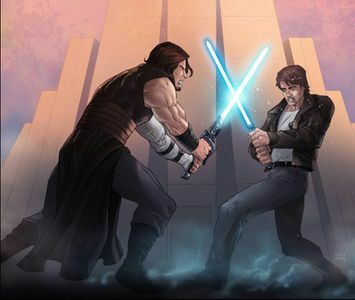 The destruction of Obelisk and Krath by Darth Pravus proved a sticking point for an extended period of time for Stahoes. During the height of the Inquisitor’s operations against so-called Undesirables he acted as a resisting member. Bentre's resistance to the Iron Throne came to a head in 35 ABY. Contacted by the Consul of Taldyran, Rhylance, Bentre replaced Lieutenant Kenson, impersonating the man through a combination of skill and Force-driven illusions. Once in position, he assisted in an attack led by the Lotus against the Iron Navy flagship, The Suffering. Openly joining the initial attack against the flag ship were the Lotus, both Arcona and Odan-Urr along with a number of unmarked ships, vessels sent by Naga Sadow to support the Lotus' operation. While the battle raged, Bentre in the guise of the deceased Kenson led the sabotage team to one of the shield generators. Once he directed part of the saboteurs to the generator covering the rear thrusters, he cloaked and worked his way back to the extraction point and the remaining mebers of their team. Members of his team, gathered in the hanger moved toward their shuttle to make an escape. Standing up against a hail of blaster fire, Bentre stood firm alongside Shadow Nighthunter to provide his fellows cover, with his lightsaber flashing from side to side to bat away the energy bolts . When one such bolt managed to slip through, Bentre threw a caution to the wind, running to his fallen ally Lucine Vasano. throwing her over his shoulder before charging back toward the escape shuttle waiting for the team's arrival. Despite the swarms of TIE-fighters, the deft piloting skills of Zoran and the assistance of Andrelious' squadron allowed the shuttle to escape relatively unscathed from The Suffering. As the team returned to the relative safety of the Odanite flagship, Solari the true weight of the situation sank in for the Sith Battlelord. Like it or not, he was now in against the Grand Master in a heavier manner than before. The news of his involvement in the operation was likely to reach Pravus' ears in one way or another. His family was going to be in greater danger for his involvement. He was going to have to prepare for war in earnest now. The attack did not end with the action of Lotus sympathizers against those loyal to the Iron Throne. Rather, upon returning to his fellows Bentre learned that a group known as the "The Collective" had staged an attack upon the Suffering. There was little time to dwell on this course of events, as similar forces attacked Clan systems. Rather than fighting Pravus and his interests, Bentre now had to rally his fellow Sadowans to fight against the larger threat. The Collective was led by one Rath Oligard, a former Fleet Admiral of the Brotherhood's naval forces. Beginning the attack on Nancora, Bentre fought alongside Aul Celsus, Evelynn Wyrm, Jurdan Krennel, Drae'lath Rahath and Erik Cato. After punching through the blockade in Krennel's ship, the strike team engaged Collective infantry, modified walker units and even experimental weather manipulation technology. Unfortunately most of the technology that Stahoes was able to recover amounted to war trophies such as the vibroblade or more grisly trophies such as the implant he pried from the head of a dead enemy soldier. Little information appears in record, and there is little in evidence which would indicate more than the Corellian's expected service to the Iron Throne at that time. When attempts were made to debrief the man on his part on the operation on the planet's surface, the former Obelisk showed a marked detachment, reiterating in a flat tone the mission objectives and indicating which objectives were completed to what degree by his team. More information was gleaned from the other Sadowans in the team to fill in the gaps, and the group were allowed to return to the Orian system. The attack on the Collective's planet left a further scar upon the man's psyche. While he was no more broken than he had been before the attack, there was a crack in the veneer. Time would tell if that crack would expand. Following the war, Clan Naga Sadow experienced a brief peace. It appeared that perhaps the Orian system would not suffer the immediate ravages of the Collective. This proved false when a bomb erupted. The Temple of Sorrow was in flames. The temple collapsed and assassins. Consul and Proconsul turned their weapons against the attackers. As Sanguinius searched the body, he found a medallion emblazoned with a familiar symbol- the three pillars of the Collective. At the Consul’s right side, Bentre Stahoes helped to organize the attacks on the planet of Ruuria. His actions in the conflict were relatively limited as he took a more supervisory role than he had in past. His intent was to ensure that as many people were able to return home as possible. Despite his desire to bloody the Collective’s nose for daring to attack the Sadowans, Bentre strode to keep a cool head. As the Clan returned to their home system, it seemed as though all was as it should be. The Clan had dealt justly with the forces on the surface of the planet, cutting through resistance with relative ease. A scouting force had been observed on the outskirts of the system, but it appeared for the time that the Clan would be able to rebuild from the recent attacks. It was not until Bentre laid eyes upon his second home system that he would realize just how wrong they really were. The return to the Orian System proved to be an unhappy one. The Warhost fleet was met by a sizable Collective force. Immediately upon leaving hyperspace, the threat was clear. In the midst of the confusion caused by the ambush, Sanguinius Tsucrya Entar commanded the Sadowan-loyal forces to jump out of the system. Seeing Kojiro Keibatsu turn one of the Ragnosian ships to defend fleeing ships, the reality of this war sunk home for Bentre Stahoes. In what seemed like a flash, Clan Naga Sadow was homeless. Sanguinius contacted the Dark Council, offering submission in exchange for support. In that moment, Stahoes found himself in command of his Clan. 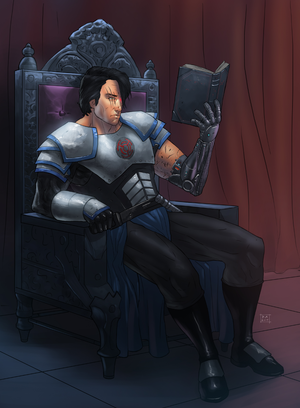 In contrast to his antagonistic relationship with Darth Pravus, Bentre chose to honor the agreement made by his predecessor, and attempted to work more closely with Grand Master Telaris Cantor. To this end, he sought out a compatriot to help hold together the Clan during this time of wandering and change. After some consultation with his circle of advisors, Ashia Kagan Keibatsu was chosen to serve with the Corellian as Proconsul of the Clan. Together, the pair would set a new direction for Clan Naga Sadow: to embody the very ideal of a Golden Age Sith Empire. The first step would be the fight to return to their rightful home, by kicking the Collective out of the Orian system once again. ""By word and deed, by blood and toil, I will honor our Clan."" Though Bentre would be plagued by frustration and bouts of manic-depression, his efforts were not going unseen. The Clan had engaged briefly with Collective soldiers in the Telos system, and joined in the liberation of the Meridian space station by the Dark Brotherhood. The Consul felt that the strikes against the Collective were too few in number, yet he still felt he could not justify the risk of a focused guerilla campaign against the faction which still held the Sadowan home system. Instead, the Consul and Summit tried to scheme how to put the Clan into the position most advantageous position to bruise and bloody the cheek of the occupiers. This, and the other work of Stahoes earned him the attention of the Sons and Daughters of Sadow. Answering the summons of the former Grandmaster Keibatsu, Bentre fell to his knees. Though he Still feared the wrath of the Lion of Tarthos being kindled against him for the loss of Muz's beloved Tarthos, Bentre was not slain. Instead, he found himself being inducted into the esteemed ranks of those who bore the honor of being inducted into the ranks of the Sons and Daughters. His works had been counted, and he had been deemed worthy. Despite the relative quiet of the larger Collective campaign, Bentre had continued to work for the betterment of the Sadowan Empire. Squadrons of Warhost Loyalists and Sadowans had been dispatched at his orders to scout out systems for potential avenues for new attacks or new allies. As these orders were being filled out, a small team came across a planet which would later be code-named Reliquary. A dark aura hung about the planet, a location seemingly frozen in time and oddly isolated from the rest of the galaxy. A cosmic anomaly kept the surface relatively untouched since the time of the Clone Wars, and the sensations felt by Macron Goura from orbit drew the interest of both the Mad Alchemist, the Consul and the larger Clan Summit. Neither the Clan nor the Consul had given up their search for ancient treasures and relics of power, prompting the launch of Operation: Antiquity. Bentre is a slightly taller-than-average human. His dark hair typically covers part of his face, obscuring his left eye and the scars around it. Scars also line below his right eye, one of two souvenirs of an encounter with the Rollmaster of Naga Sadow, Anima. The other is the Tuk'atan eye that replaced his ruined left eyeball. The missing eye is not always an obvious feature, as Bentre has learned to alter his appearance to hide it when he deems necessary with a Force illusion. He also bears some scarring around his right wrist from an encounter early in his service against another apprentice, and a bionic prosthetic where a large portion of his left arm used to be. His clothing of choice on the rare occasion when he is not on duty is a white undershirt below a jacket of bantha hide, and simple pants. Though even in such simple clothing, he still manages to carry himself with an air of obvious self-importance. Otherwise, Bentre is typically seen wearing an almost ceremonial armor bearing the crest of his Clan or his personalized set of dark armor. It is worth noting that he does occasionally don a set of ancient Sith armor, but that is saved for the gravest of ceremonies. "You really have to hand it to them. They managed to hone themselves into this great fighting force without using the Force as a crutch." 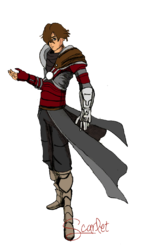 Bentre holds his Clan dearly, and his relationship with those who called themselves Versea even more so. Of particular note is Consul Sangiunius, whom the Sith has formed a particularly close friendship with despite the seeming disparity between their attitudes. Aul Celsus, Jurdan Krennel, Armad and a number of others have garnered respect ranging from grudging to great. As the reality of his position sunk in for the Corellian, he chose to forget old rivalries among his fellow clan. The responsibilities to the Clan were more important than such trite matters. Deeper than his relationships in the Clan at large are those who count themselves as Versea. From his former apprentice Firith’rar, to Lilith to his new brother, or even the largely reclusive Jason Kane, he would gladly jump to the aid of any member of his family should the call go out. Even among the individuals who comprise the likes of the Warhost, Mercenaries and Loyalists alike, seem to gather Bentre's respect more often than not. He has repeatedly said that he can appreciate a professional who manages to hone their body into a powerful tool. While weakness may gather his disdain, he does not hold such limitations against those who have proven their loyalty in service. His greatest enmity seems to be held for those who turn on him and his, both family and Clan. The others, including the weakling Jedi Order which continuously tries to defy Pravus, he counts more as rivals in one form or another than enemies. As such, he does not warrant them worthy of disgust. He has developed an odd variety of relationships with members of the Dark Brotherhood at large. Despite his little tiff with Edgar Drachen for example, he would buy the man a drink if their paths crossed again. Bentre also has a strained working relationship with members of the Lotus. In particular, he holds a respect for some such as Shadow Nighthunter, despite external loyalties, for their devotion to the former fight against Pravus. Bentre also possesses some notable *professional* relationships with current and former members of the Dark Council. He possesses what could be considered a grudging respect for Telaris Cantor as Grand Master, for example but has a more than amicable relationship with former Headmaster Farrin Xies. There are others, like Deputy Grand Master Selika Roh. Stahoes had served under Roh before taking up the mantle of Master of Holcrons for himself. The time working together has cemented a respect for the woman in the heart of the Corellian Sith. Bentre chooses to live a remarkably spartan lifestyle. Were it not for his wife, his quarters would be rather bare, save for a few mementos such as the Sith Sword he earned from his studies or the Holocrons collected over time. For him the act of furnishing outside of necessity becomes a waste of time. His most valued possessions include his first lightsaber, his custom-built lightsaber, his datapad, his vibroknife and his S-5 blaster pistol. He also has an older model blaster that he keeps in a chest in his office aboard the Warhost's Perdition along with other weapons once kept safely in the Temple of Blood. What could be considered an oddity among the equipment he keeps in his quarters on Sepros would include the Sith Helm he keeps as a reminder of his service period where he was tasked with guarding the Grand Master, Pravus. He keeps it to remind himself of the peril which the Versea, his Clan and the Brotherhood have suffered at the orders of the Grand Master. Other equipment- explosives, synthflesh dispenser, voice modulator and even a repulsor belt are simple tools of his trade as a Shadow. To his personal chagrin, he does not often get to practice this role within the Brotherhood. His time is more often taken up with his roles as Consul and as Master of Holocrons. Particularly notable among his possessions, is the coveted Bottle of Sadow that Bentre Kairn'tel recieved upon his induction into the circle of Clan title holders of Naga Sadow. This item is kept in a secured location in his office aboard the Clan's Imperial II Star Destroyer Perdition. Since its acquisition, there have been whispers that Bentre spends long nights testing the full capabilities of his own bottle. Bentre Stahoes specializes in Slicing, Subterfuge, Sith Alchemy and lightsaber combat. He focuses on the use of the "simple" form of Shii-Cho in combat and takes a great interest in artifacts and antiquities of the Sith. He is also interested in the culture and practices of other Force-Sensitive groups such as the Jedi. This is bourne not out of a desire to emulate them but rather to understand them from a more scholarly perspective. Stahoes has some extensive practice with blaster weapons- a skill that has unfortunately deteriorated due to his extended focus on the lightsaber. Besides the training he received as a member of the Grand Master's Royal Guard]], Stahoes has also trained in the basics of Echani. His endeavors to improve his combat abilities were rewarded on three occasions in which he acted as a Royal Guardsman to a member of the Dark Council: to Darth Pravus, to Cethgus, and most recently to Telaris Cantor. Though he has ceased to act in an official capacity with the Shadow Academy he manages to accomplish some study in his free time on various subjects in an effort to extend his own base of knowledge. He has found also found his seat as Keeper of Holocrons of particular use in this pursuit. This page was last modified on 16 March 2019, at 22:53.